Broadcast Journalist. Analysis and stories from around Europe. Andrew is currently a producer at Sky News. He was formerly a producer at CNN International in London. He is fluent in French, Spanish and Catalan, and speaks decent Portuguese, Italian and German. Andrew can often be found exploring somewhere in Europe. He was educated at King’s College, Cambridge, Cardiff University and the University of Barcelona. Greek negotiations are looking more precarious – and harder to predict – than ever. This weekend saw a hard-ball approach from Germany’s finance minister Wolfgang Schäuble, who proposed allowing a temporary exit for Greece from the euro, and an even clearer line from Finland, who rejected the latest proposals, that trust has completely broken down – its finance minister erring more on the side of a Grexit than keeping the country in the single currency. One official said some of the proposals appeared designed to “humiliate” the Greek prime minister Alexis Tsipras and his Syriza government. Germany stands together with Baltic states, Slovenia, Slovakia and the Netherlands in being uncompromising and more willing than ever before to see the 19-member currency break down. Meanwhile, hope still rests with Southern Europe states such as Spain, Portugal and Italy, who have shown themselves to be far more ready to fight for a deal, owing in part to their own economic troubles. A Greek exit would do them no favours, as the ripples of a broken Europe would flood the entire continent no less. By far the most loyal supporter of Greece throughout the negotiations has been France. Newspaper reports at the beginning of the week outed the fact that advisers from the French Treasury had been in Athens, helping the Greeks to draft out the proposals that prime minister Alexis Tsipras handed to the European Council on Thursday evening. One adviser said: “It’s the Greeks who are holding the pen, but they are using us as a sparring-partner”. Sceptics have used this as a means of exaggerating France’s role, retorting that the Greeks would be incapable of working alone on the list of reforms. Greece needs expertise, and for France, it shows that they are at the very centre of the European game. On Sunday, Hollande dismissed German proposals of a temporary Greek exit, which had grabbed many of the headlines. He asserted: “There is no temporary Grexit, there is a Grexit or there is not a Grexit”. For each French citizen, Greek debt totals 600-700 euros. Although the eurozone has tried since the beginning of this crisis to build a firewall around Greece, a Grexit would nonetheless spell a loss of 55.7bn euros to the French, far more than either Italy or Spain, according to 2012 figures. France’s president, François Hollande, has long been working hard for a German compromise in achieving a deal, acknowledging the suffering of the Greek people and the need for “indispensible” reforms. On Wednesday, he said Greece’s latest proposals for its next 59bn euro bailout were both “serious” and “credible”. Hollande equally talked of the need of a united Europe, whose break-up Angela Merkel could realistically never allow herself to preside over. The Greek crisis has marked the fracturing of the symbolic, long-standing Franco-German micro-managing of the European Union’s recent troubles – Angela Merkel seems more than ever to run the show alone – her calm, measured approach resonating far more than any other leader. Echoing the language of Hollande, he said a compromise had to be found, with ambitious reforms for Greece, but not so much so that they destroy the country’s economy, given its already painful course of austerity. Investment was needed for growth, but Macron maintained a critical line against Syriza and Tsipras, who is no hero of the Greek people, he said. François Hollande has always been seen to be more presidential on an international stage, from France’s military intervention into former colony Mali’s war against Islamists, to the British co-ordinated attack on Libya. In reality, he is continuing to struggle with his own domestic politics – a weaker-than-expected economic recovery, with unemployment refusing to budge. Economic growth for this year is predicted at 1.2%, admittedly far more than the 0.4% average growth of the past three years. A strong Europe can not only afford Hollande a more statesman-like appearance on the continental stage, more crucially it pays to counter the anti-EU rhetoric of Marine Le Pen’s Front National party, whose reaction to Greece’s ‘no’ vote was to laud Greek PM Alexis Tsipras as a respected leader and a man of the people. She was clearly drawing on the rhetoric of increasingly potent populist politics sweeping across Europe. To draw parallels, Le Pen conjured up the figures of Mitterand, even de Gaulle, to colour her complimentary remarks. At the same time, she attacked Hollande for being the “cabinet director of Jean-Claude Juncker”. Le Pen talked of the victory of the ‘no’ camp as a means of standing up to the “oligarchy” of the EU, the “diktats” of the single currency and an “inhumane” austerity. In short, she said: “this No is excellent news”, spelling the end of France throwing money into Greece’s black hole of debt. She even coined the term “eurosterity” (or eurostérité), calling for the dissolution of the single currency, which she likened to a vanity project which was saving face only by imposing tough austerity. Running short of allies, Alexis Tsipras cut a lonely figure around the negotiation table on Sunday. As leaders enter a new week of talks, nobody really knows whether Greece is blindly tip-toeing to the exit door, or if the solidarity shown by the likes of France will ultimately lead to a last-minute deal. After leaders ignored the seemingly apocalyptic Sunday deadline, the can-kicking that has characterised negotiations looks set to continue, for how ever long it can. I set myself the challenge of writing a concise analysis of Spain’s year in 2014, with a look at how the country’s next year will shape up. It will be a year of elections and plenty of political excitement, set against a Europe which is still far from mended. Any comments, please do tweet me @andrewiconnell. I’d love to hear your thoughts. They come and go so often that Spaniards of today are no longer surprised by their political class. One word that is synonymous with Spanish politics today is corruption, and it appears in the TV news and newspapers every single day. This distrust in politicians and their true motives may surprise but goes no way to placate the Spanish population. As 2014 closed, there were more than 2000 corruption cases in Spain, ranging from national to regional levels of government, and equally in the royal family. Spain’s monarchy had little trouble in dealing with the transition of power from Juan Carlos, the towering figure of Spain’s ideological transition, to his son Felipe VI. The case surrounding Princess Cristina, the King’s sister, whose husband is accused of obtaining millions of public funds, which then implicated her on tax fraud charges, may force her to renounce her accession to the throne, and disgrace the family name. In 2015, expect more corruption being picked apart by Spain’s media, but don’t be surprised. Unfortunately, Spain seems to have become accustomed to such debauchery. Political indignation was a movement that started in Spain back in 2011. Today, it is coming back to haunt politicians most recently following the passing into law of the so-called “Ley Mordaza” – the gagging law. Its content for many Western democracies is eyewateringly draconian. Fines are levied for taking photos of police officers, as well as demonstrating outside government buildings, and it has driven many thousands onto the streets to voice their opposition. It is being seen as an attempt by the conservative government to silence its critics for their handling of the financial crisis. The fight for rights in Spain’s civil society will continue well into 2015. One story that caught the attention of the Spanish media has been that of pequeño Nicolás, or little Nicolas. It has played out like a movie thriller – there well may be an idea there. A boy of 20 years old, accused now of forgery, fraud and identity theft, allowed himself to rub shoulders with influential members of Spain’s governing party, to the point that Nicolás managed to somehow shake hands with Spain’s monarch, Felipe VI, during his coronation. The pale-faced law student – who hardly ever attended classes – has appeared in countless photographs crowding PP party politicians, including questionably closed-door meetings in party headquarters. Nicolás hired bodyguards, yachts and flash cars in order to pretend to live a high, double life, and allegedly posed as a member of Spain’s secret security forces. Did Nicolás’s infiltration into high political and economic circles lead to any influence? How was it that such a shadowy and young figure was allowed to get so close to politicians? A debate about trust in politicians has already started, as waves of public indignation continue to abound with ever greater magnitude. It has also been quite the year for the Catalans. After a non-binding vote in November, talk in the region surrounding calling early elections and shared ballots is continuing. What could once have been seen as a perfect political marriage between Catalan president Artur Mas and coalition partner Oriol Junqueras is starting to produce more difference and disagreement. Demands for early elections are numerous, and look to be coming down the way in May. With absolutely no offer of an olive branch from Spain’s prime minister, Catalan independentists will be continuing to look around Europe for allies and specifically to Brussels to grant them a democratic means of recognising desires of independentistas to break away from the rest of Spain. In terms of the popularity of independence in Catalonia, data from The Guardian has shown it’s a rising cause, though polls over the years have arguably pegged yes and no fairly level. A later poll in 2014 pushed no ahead of yes for the first time, but it is still very close to call. For its detractors, what marked November’s consultation were those who didn’t turn to the ballot. They may have been too scared to vote since the vote was deemed illegal; they might have thought it wasn’t worth voting because it was non-binding. These arguments work for both the yes and the no camps. Those who did turn out, more than two million of them, voted resoundingly yes-yes to the questions of whether Catalonia should be a state, and if so, should it be independent. I predict results of the early elections in the region will send out a very powerful message of increased support for independence, at the very least from sheer frustration. Catalonia reached levels of international consciousness in this symbolic referendum through the media – an event that spoke as loud as the crowds did when gathered on the streets of Barcelona during Catalonia’s national day on September 11. This year a V for victory and vote marked the celebration. International consciousness of their cause is equally key for independence to gain further ground. Much of what can or could happen in Catalonia will be debated in anticipation of the national election towards the end of 2015 with each party gesturing and speechifying, but only when all the cards are on the table and Spain knows exactly who will be governing them will Catalans know either way how close or far they are from gaining a definitive referendum. What will also decide Catalonia’s politics is the outcome of an ongoing legal case which has implicated Catalan president Artur Mas and several allies for illegally carrying out November’s consultation. Artur Mas in his New Year speech bemoaned the fact that the vote should have opened a route for political dialogue, not a legal dispute. The fact that Mariano Rajoy said nothing in anticipation of the vote and allowed it to happen was telling enough of the Spanish prime minister’s way of handling what he says is a side issue which has been growing because of, and not despite, the economic crisis, in his words. The results held no credibility for him. One more thing that is central to Catalonia’s independence and a sweetener for the rest of Spain: constitutional reform. This is the current stumbling block stopping Catalans from voting, as currently all of Spain would have to be consulted on independence. The leader of the Socialist party says that by reforming the Magna Carta his party will create a more federal Spain, allowing other regions more local powers, but not so far as to allow Catalonia to vote on its own future. Podemos has straddled the two sides: they recognise Catalan and Basque desire for a right to vote, but oppose Catalan independence. The party’s leader said he wants to continue to build Spain all together. In an election year, it is no cliché to say that it is all to play for. While Prime Minister Mariano Rajoy claims that the crisis is over and Spain is well on its way to recovery thanks to his strong governance, Spain’s now tripartite political scene has produced opinion polls that in recent months mean it is very close to call a winner in next year’s general election, expected in November. They have been tussling over economic figures and questioning the recovery, as well as bandying around the perennial need for “change” in Spain. What the media has been calling the Podemos “phenomenon” could be to some extent a victim of its own success. With increased popularity – which the party undoubtedly has garnered – there has come greater scrutiny, in a year in which the movement became a party, gained a leader in Pablo Iglesias, and outlined some of its key measures, several of which it had to revise. Its rise has been astronomical to say the least. Populism has been spreading across a Europe which has experienced huge change politically from the start of the crisis, with more questioning of austerity and how countries can move away from the spectre of long-term European deflation. Can Podemos, having won five seats in the European elections in May, stand up to the bigger, more established parties and assert itself with a wide range of credible, not pie-in-the-sky, policies? Even the most seasoned of political commentators can never with complete certainty predict elections, and Spain is no exception. A lot can happen in the next year, and for all three main parties, mere points in opinion polls will be keenly fought over. 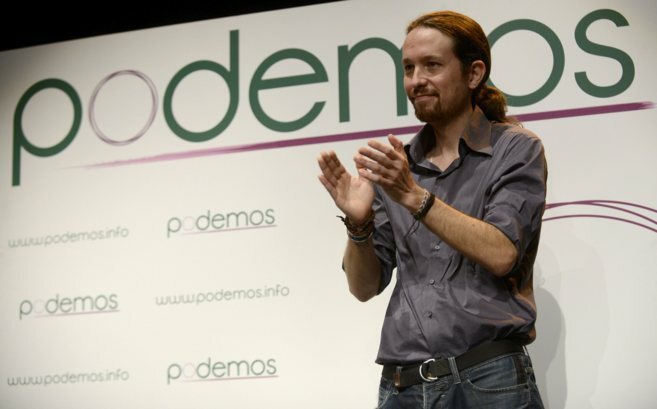 What Podemos may find hard to achieve on the European stage is credibility. By virtue of being such a new party which formed from a movement with members who are more at ease in lecture halls than parliament buildings, Brussels will undoubtedly eye this party with great uncertainty, as it is already doing with Syriza, the left-wing juggernaut in Greece. With Spain still on such an uneven economic footing, which many would say is as a result of painful, unfair and ignorant cuts and political decisions, Podemos is likely to rattle market confidence in Spain’s ability to become a fully convalescent patient in Europe. In its battle for hearts and minds, Podemos would win tomorrow. It’s not difficult to see that the need for Podemos, in a crisis which not only has political and economic facet but a huge social one, was long overdue. Its grass-root formation may just win it for them and be a shot in the arm for the European project and Spain’s traditional parties who couldn’t have expected a huge shake-up in Spain’s political scene. This year saw the Socialist party gain a new leader in Pedro Sánchez, who is using Spain’s 1978 Constitution as a means of encouraging reform and a new start for Spain’s democracy. He is pushing Spain’s political classes on transparency, in a year which has seen most parties, according to research, become far less opaque with the voting public. Podemos meanwhile says that while the transition to democracy in Spain is now history, its legacy has produced a political climate built on mistrust and corruption. Another cliché: it’s all about the economy. This may be somewhat of an exaggeration, but economic prosperity will be a key battleground in the election. Is everybody benefiting from Spain’s recovery? Definitely not. Does the recovery even exist? According to the data at least, mostly. While growth is heading upwards – and the Economy Minister Luis de Guindos very happy to vaunt Spain’s growth figures for next year of 2% – unemployment will remain both stubbornly and depressingly around the 23% level that it has been around for a while. Youth unemployment the same. On a recent trip to Madrid, I listened to rousing and heartfelt addresses to trains and metros by those touched by unemployment, eviction, huge money troubles, ultimately requesting spare change. One woman even laid packs of tissues on seats with a note explaining her sorry predicament. Passengers bow their heads and avoid eye contact, seemingly far too used to these undignifying, desperate, yet polite, calls for help. Perhaps the biggest issue for Spain, and for Europe, will be the waves of immigrants from unstable and war-torn parts of the world. 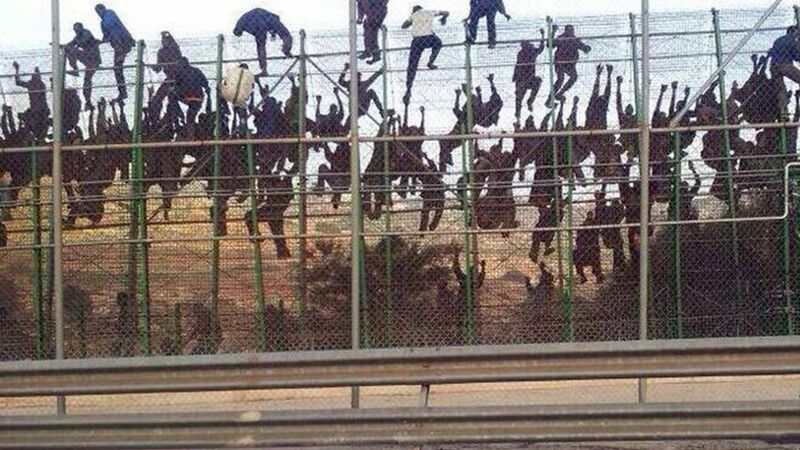 Scenes from Spain’s enclave of Melilla in Morocco of immigrants storming border fences are a reminder of how close the European continent is to North Africa and the Middle East, where the savagery in Syria and elsewhere is allowed to fester. Countries in Europe are now the place of refuge for several hundred thousand people. The debate around how Europe handles the humanitarian disaster leaking from conflict is going to be increasingly important, as the war in Syria moves into its fourth year. It will require the work of many nations. Though much of Spain’s news this year has been of domestic significance, the rise of Podemos, the battle for independence in Catalonia, trust in politicians, and economic recovery are themes that are springing up all around Europe going into 2015. Not only is their outcome hard to predict, such problems will also take more than just one year to mend.